Paul Ince began life as manager of Blackpool with defeat at Leeds. David Norris opened the scoring in the second half when he scored with a well-controlled half-volley, before Steve Morison recorded his first goal for the club with a lovely lofted finish. 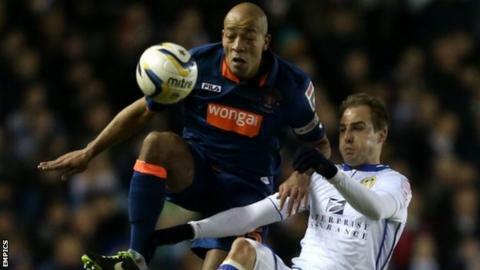 Leeds also went close through Luke Varney and Ross McCormack. Blackpool's Ludovic Sylvestre had a 30-yard strike tipped over and Gary Taylor-Fletcher had the ball in the net, but he was ruled offside. The result is Leeds' first win in four league games and moves Neil Warnock's side to within six points of a play-off place. They were the better side in the first half with Varney twice going close with headers, the second well saved by Matt Gilks. Scotland forward McCormack then made a mess of a shot from three yards before he had an effort cleared off the line by Craig Cathcart. The visitors came back into the game later in the half. Sylvestre was first to test the goal with a fantastic strike that was heading into the top corner only for Paddy Kenny to deny him with a superb stop. Moments later, Taylor-Fletcher thought he had scored after he tucked the ball past Kenny after the keeper had parried Matt Phillips's shot - unfortunately for Ince's side the forward was offside. The second 45 minutes was also entertaining, but it was Leeds who made the most of their chances. They took the lead when Norris, who had quite a quiet game, gave Gilks no chance with a great half-volley. But that finish was bettered by Morison, who got himself between both centre-backs before lifting his effort over the Blackpool keeper. Tom Ince nearly gave his father something to smile about in the closing minutes, but directed his header over the bar. "I couldn't pick a star tonight. They were all nine or 10 out of 10. "We started on the front foot and limited them to just a couple of opportunities, which would have been cruel if they'd gone in. Paddy made a couple of great saves and I couldn't see him being beaten. "If you brought another manager in I couldn't see him getting more out of those players than you saw tonight." "It would have been nice to start with a win, but this time last week I was sitting in my lounge or walking the dog in the garden, so it's good to be back in football. "Paddy Kenny made two or three outstanding saves for them and in the second half we had chances which didn't quite fall for us. I was disappointed with the goals we conceded, but we played some good stuff at times. "It is early doors. I've only been through the door for two days and there is a lot to work on. We are not organised or structured at this moment, you can see that. "We have a match on Saturday, then a free week when we can get the lads out on the training pitch and get a few things sorted out."